Every Friday authors from around the world gather at the virtual fireside of fellow blogger Rochelle Wisoff to share flash fiction stories of 100 words, all prompted by a common photograph, and exchange constructive criticism. Readers’ comments are also welcome. This week’s photo prompt has been provided by Beth Carter whose blog Beth’s Banter is about writing, marketing, motherhood, timely topics and random thoughts. I write children’s picture books, women’s fiction, contemporary romance, romantic suspense, six-word memoirs, short stories and haiku. Beth took a first prize with this photo at the Ozarks Writers League photo contest in February. Congratulations! Sure she breathes! Though it sounds like Siberian throat singing. She’s just your everyday girl, though the boy next door avoids her. Built her with my own hands, though I had to pay two men at night for some of her parts. “I’m yours, baby,” sang Ray. “Hotter than July,” sang Stevie. “Let’s take the long way around the world,” sang Ronnie. “Love at first sight,” they joked. She fitted right in with those hot rods in Bonneville. She took to disappearing. There’s news of a hit’n run. We’re heading for the mountains: me, her, Ray, Ronnie and Stevie. This entry was posted in Dialogue, Short Story Writing, Writing and tagged Bill Wendt, Comedy Writing, Dialogue, Fiction, Flash Fiction, flash fiction, Frankenstein, Friday Fictioneers, hot rod, Online Writing, Philosophy, Ray Charles, Ronnie Milsap, Short Story Writing, Siberian Throat Singing, Stevie Wonder, The Ozarks, Writing. Bookmark the permalink. Siberian throat singing! Brilliant! Nice road story..
Nicely said, liked the personification of the car. your story has a surreal feel to it. the first three lines all contain “though,” with a similar sentence structure. were you going for that repetition, or was that just a coincidence? well done, and good use of so much of the picture. Intriguing story, though I’m still not still about whether I want to hear “Siberian throat singing.” Fun and expansive take on the prompt! i like your, “news of a hit’n run…” and i am guessing by your tags that those three were hit artists once upon a time. good story. Siberian throat singing… interesting. I like how you used the names on the sign, Ann… clever story. Thank you Ted. I did try throat singing – once. I need my vocal chords for a little while longer! I have to admit a bit of a disconnect. Was this story a reference to a particular song? In any case your MC sounds like a free spirit. Had to pay two men in the night for parts? Now that’s intriguing not matter what. Thanks for the explanation, Ann. It all makes sense now. I enjoyed this, well done. nice twisty story. I enjoyed it! Let me know when you locate the owner. He or she will be interested to read all the stories your excellent photo of his/her car has generated, I’m sure. And I’d really like to know if it does sound like Siberian throat singing! “She’s just your everyday girl, though the boy next door avoids her.” <— love, love, love this line! Never too old! I’m 62 next month but last Christmas I made my solo debut singing Mozart’s Laudate Dominum. The doors were sealed in advance, of course, so the boys couldn’t escape. 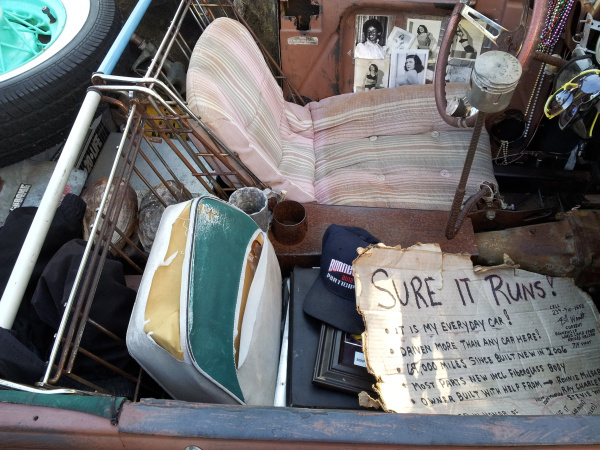 Love this – that the car has her own spirit and despite her poor looks, both she and all the boys still sing. Thanks Claire, for your insightful comments. And you made me laugh as from your description, it may be unintentionally autobiographical. Just a bit! Or more than! Oops, I posted my reply in the wrong place! Thank you! Your comments are always valued and appreciated. I’ll be checking your story out shortly.